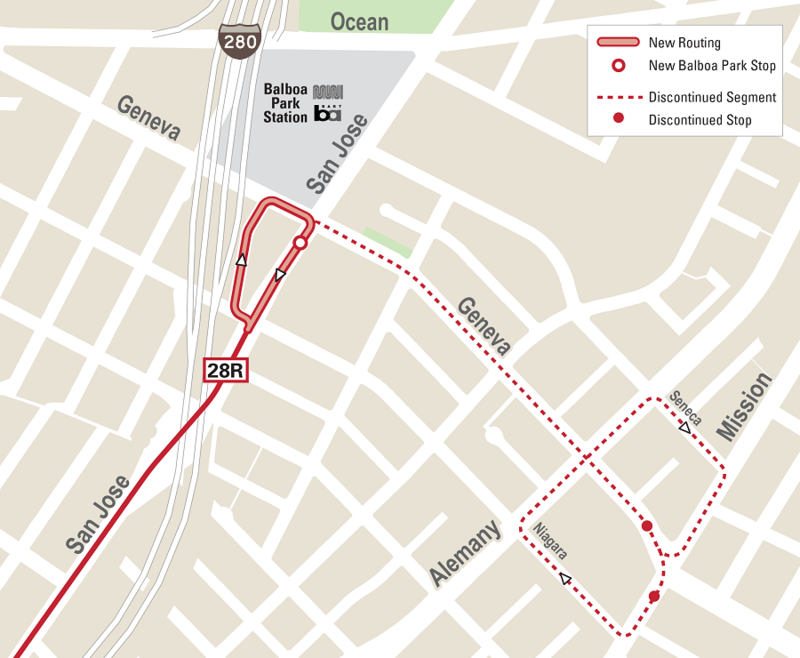 As part of our ongoing efforts to move Muni Forward, we’re launching a package of small but important service adjustments on Saturday, February 25. Based on feedback from Muni riders, we’re increasing service and on popular routes, adding bigger buses on the 5 Fulton and making stop and schedule adjustments to make service faster, roomier and more reliable. A 60-foot New Flyer bus at Muni's Flynn Division. We’re adding more of our bigger, 60-foot trolley buses to provide more room for riders on 5 Fulton local and Rapid service, following their introduction to the 5R Fulton Rapid last year. The route will get even better and safer later this year with street improvements planned along McAllister Street as part of the 5 Fulton Rapid Project. 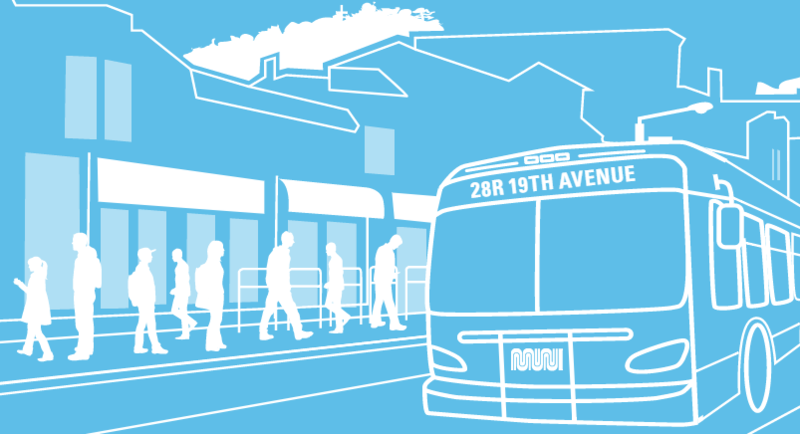 New stop at 19th Ave. and Noriega: To make the 28R 19th Avenue Rapid convenient for more people to use, we’re adding a stop at 19th Avenue and Noriega Street in both directions. We’ve heard requests for 28R service at this location, and we’re excited to offer neighbors better access to the route. Route change near Balboa Park: The southern portion of the 28R route will be shortened to make service more reliable. Specifically, the last stop for the 28R will be moved from Mission Street and Geneva Avenue to the Balboa Park BART/Muni Station. The 28R’s southern terminal will temporarily be on the southwest corner of San Jose and Geneva avenues while we continue to work with the community to identify a permanent location. For Muni access between the station and Mission and Geneva, you can board the 8 Bayshore or 43 Masonic. Since we launched improvements on the 28R last April, ridership on the route has doubled. Last April, we launched extended 28 Rapid service that runs every 10 minutes on weekdays from 7 a.m. to 7 p.m. We also modified the route to connect northwestern neighborhoods to Balboa Park Station. These upgrades on the 8AX and 29 were recommended as part of the Muni Equity Strategy, in which we identified ways to improve service in neighborhoods with the greatest need. Note on the F Line: In recent months we’ve seen issues with streetcars and buses crowding at the line’s terminal at 17th and Market streets. This slight reduction in service frequency is expected to help make the line more reliable. 5 Fulton / 5R Fulton Rapid: The inbound 5/5R stop at Fulton Street and Masonic Avenue will be moved from the near side of the intersection to the far side to allow buses to pass the traffic signal before they stop. 5 Fulton Owl and 7X Noriega Express: The inbound 5 Owl and 7X stops on Golden Gate Avenue at Hyde and Jones streets will be discontinued. The 5 Owl stop at Golden Gate and Leavenworth Street will moved to the far side of the intersection and will be also be served by the 7X. 10 Townsend: The inbound and outbound 10 stops at 2nd and Folsom streets will be discontinued. 12 Folsom/Pacific: The outbound 12 stop at 2nd and Folsom streets will be discontinued. 27 Bryant: The outbound stops on Bryant at 13th and Alameda streets will be discontinued, and a new outbound stop will be established at Bryant and Division streets. 48 24th-Quintara: The outbound stop at Quintara Street and 43rd Avenue will be moved from the far side of the intersection to the near side. L Taraval / L Owl: As part of the L Taraval Rapid Project, eight L stops will be discontinued to make service faster and more reliable: The inbound and outbound stops on Taraval St. and 28th Ave. and Ulloa St. at 15th Ave., the inbound stop at Taraval and 24th Ave. and the outbound stops on Taraval at 17th, 22nd and 35th avenues. The initial L Taraval improvements are well underway, and more Muni Forward upgrades are coming across the city this year. Head to our Muni Forward webpage to stay updated and share questions or comments.